A forwarder is a feature you can enable on your network that automatically forwards any incoming email to another email address. This feature is most often used when an employee is on vacation or leave, and the employee’s manager requests that someone else temporarily handle the absent employee’s email. 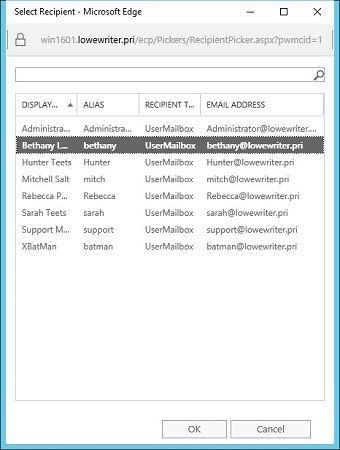 In the Exchange Admin Center, open the User Mailbox page for the user. Select the Mailbox Features tab, and then click View Details in the Mail Flow section. The delivery options are displayed. Select the Enable Forwarding check box. Click the Browse button. The Select Recipient window appears. Select the recipient you want to forward the email to and then click OK. The name you selected is displayed in the text box next to the Browse button in the Delivery Options page. Select the recipient for the forwarder. 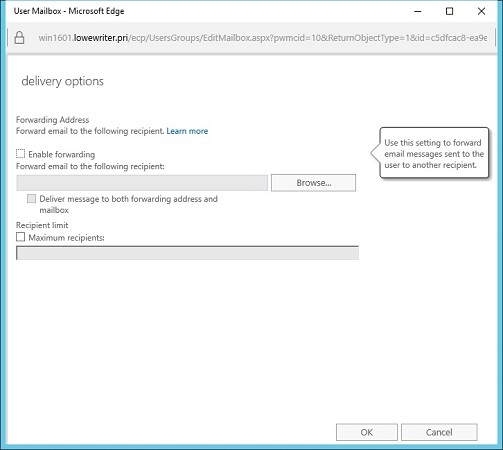 If you want the email to be delivered to this user’s mailbox in addition to the forwarding address, select the Deliver Message to Both Forwarding Address and Mailbox check box. If you leave this option deselected, only the forwarding address will receive the email; the mail won’t be delivered to this user’s mailbox. Click OK to close the Delivery Options page. You return to the User Mailbox page.